I’ll be honest, as much as I’m looking forward to the Eclipse meeting at Sandown, I can’t give it my undivided attention, not when a re-match between Harry Angel and the incredible sprinter Caravaggio looms on the horizon at Newmarket’s July meeting, next weekend. Add the Tin Man into the mix and it could be a classic. However, let’s take a look at Sandown and see what might be paying the bills this month. The first day of the meeting (today) looks a nice appetiser to the main event. In the 4.30, UAE King (13/8 currently) and Opposition (4/1) look the two to side with. Saturday’s card is packed with group action. I’ll be looking at the 1.50 and forgetting Battash and Muthmir at the head of the market, instead looking at Goldream and Line of Reason, both e/w. The Eclipse itself (3.35) looks all about Cliffs of Moher, the Derby runner-up against Barney Roy, conqueror of Churchill at Royal Ascot. The market would suggest Aidan O’Brien’s runner will take the beating, but there might be better value in backing Decorated Knight e/w, as successfully advised when second behind the top-class Highland Reel at Ascot last month. Roger Charlton’s runner will enjoy the fast ground and should make the frame at least. One fly in the ointment could be Eminent, son of Frankel. An excellent run in the Derby gives him a good chance here. In the lucky last (4.40), Frontispiece for the dream team of Stoute and Moore looks to have an outstanding chance but could be a warm order. Good luck, enjoy the racing and get ready for next weekend’s mouth-watering line-up for Newmarket’s July meeting. We’ll look forward to that next week. Those of you who don’t live in a cave will be aware that the Wimbledon tennis Championships at the All England Club are currently taking place. It’s the Cheltenham, the Derby and the Royal Ascot of tennis, not only in this country, but around the world. All tennis players dream of winning Wimbledon, much like most jockeys will dream of riding the winner of the Derby or the Cheltenham Gold Cup. Yours truly will be heading to Wimbledon on Monday 10 July to sample the atmosphere and perhaps look at how tennis’ flagship event lines up against those of the horse-racing world. I’ll take a few photos, note a few things down and then, if previous form is anything to go by, get absolutely smashed, lose my phone, not remember a thing, and so make something up next week to tell you. Without wishing to cast doubt on my love for racing, and not wanting to cause controversy that will reverberate throughout the sporting world(! ), tennis is actually my first love. I used to play tennis, not in a pat-ball, holiday at Centre Parcs kind of way, but a high standard, competitive kind of way. I still play now, although getting schooled by the Editor of The Sporting Blog is getting rather tiresome, the talented *$@*. I’ve been to Wimbledon before and enjoyed it, even securing access all areas through Mrs McCoy, who used to work in the tennis world; I’ve enjoyed the atmosphere, usually finding myself fairly well refreshed thanks to the wonderful ruling that one can bring a bottle of booze into the grounds. Wimbledon 1 – Horse Racing 0. That bottle of Lanson Rose (at less than half the price that Wimbledon sell it for, mugs) really gives a solid base on which the pints of Stella/Grolsch can build. 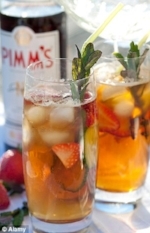 Pimms? £8.50? You are having a f*cking giraffe. But now the goalposts (didn’t want to leave football out of this multi-sport mix-up) have changed. I don’t have the access all areas pass as Mrs McCoy selfishly left the tennis world. I am but a civilian, one of the great unwashed, although in Wimbledon’s case one of the great very well washed and immaculately groomed. I’ll be queuing for drinks like everyone else – let’s just hope the service is better than at Cheltenham this year. I almost died from dehydration between each race and ended up having to smash each pint in around 5 minutes. So, the contest is on. Cheltenham v Wimbledon – which will be the victor? Watch this space. Join me next week for a review of the Eclipse and a look back at my trip to Wimbledon, if you don’t read about it first on the 10 o’clock news on Monday night. We’ll also get stuck into what is shaping up to be a cracking July meeting at Newmarket next weekend. We might finally get to see if Godolphin’s Laugh Aloud is the machine that I’ve built him up to be, and whether or not Caravaggio is bullet proof as he seemed at Ascot. Exciting times ahead.